This class is the class for handling Copasi object names. Definition at line 32 of file CCopasiObjectName.h. Definition at line 40 of file CCopasiObjectName.cpp. Definition at line 44 of file CCopasiObjectName.cpp. Definition at line 48 of file CCopasiObjectName.cpp. Definition at line 52 of file CCopasiObjectName.cpp. Definition at line 126 of file CCopasiObjectName.cpp. Referenced by CExperiment::compile(), CCopasiParameter::getCN(), CCopasiObject::getCN(), and CCopasiObject::setObjectName(). Definition at line 159 of file CCopasiObjectName.cpp. Referenced by getElementName(), getObjectName(), getObjectType(), getPrimary(), and getRemainder(). Definition at line 86 of file CCopasiObjectName.cpp. Referenced by CCopasiVector< CLGeneralGlyph >::getObject(), and CArrayElementReference::getValuePointer(). Definition at line 104 of file CCopasiObjectName.cpp. References findEx(), getPrimary(), and unescape(). Referenced by getElementIndex(), CCopasiContainer::getObject(), CArrayAnnotation::getObject(), CCopasiVectorN< CReportDefinition >::getObject(), CArrayElementReference::getValuePointer(), and CModelParameter::nameFromCN(). Definition at line 74 of file CCopasiObjectName.cpp. Referenced by CCopasiContainer::getObject(), CCopasiParameterGroup::getObject(), CCopasiVector< CLGeneralGlyph >::getObject(), CCopasiVectorN< CReportDefinition >::getObject(), and CModelParameter::nameFromCN(). 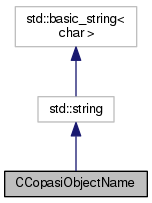 Definition at line 67 of file CCopasiObjectName.cpp. Referenced by CModelParameterReactionParameter::compile(), CCopasiContainer::getObject(), CCopasiVector< CLGeneralGlyph >::getObject(), CCopasiVectorN< CReportDefinition >::getObject(), and CModelExpansion::updateExpression(). Definition at line 55 of file CCopasiObjectName.cpp. Referenced by CModelParameterReactionParameter::compile(), getElementName(), CMathContainer::getObject(), getObjectName(), getObjectType(), CModelParameter::nameFromCN(), CModelParameterSpecies::setCN(), and CModelExpansion::updateExpression(). Definition at line 58 of file CCopasiObjectName.cpp. Referenced by CModelParameterReactionParameter::compile(), CCopasiContainer::getObject(), CCopasiParameterGroup::getObject(), CArrayAnnotation::getObject(), CCopasiXMLParser::getObjectFromName(), CModelParameter::nameFromCN(), CCopasiDataModel::ObjectFromCN(), CModelParameterSpecies::setCN(), and CModelExpansion::updateExpression(). Definition at line 143 of file CCopasiObjectName.cpp. Referenced by getElementName(), getObjectName(), and getObjectType().